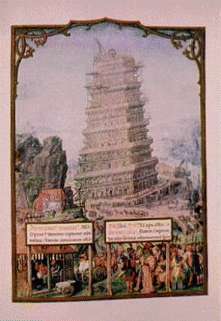 The building of the Tower of Babel and the Confusion of Tongues (languages) in ancient Babylon is mentioned rather briefly in Genesis Chapters 10 and 11. Genesis 10 is the so-called "Table of Nations"--a list of 70 names of Noah's descendants through Shem, Ham, and Japheth. The list is probably not complete, but we are given a good picture of the division of our race into three branches each having been gifted special giftedness and unique qualities by God, highlighting the spiritual, intellectual and physical sides of man as he was created in the image of God. Genesis 10:6-12 includes a parenthetical section on one of the sons of grandsons Ham, Nimrod the son of Cush. "Babel" is composed of two words, "bab" meaning "gate" and "el," "god." Hence, "the gate of god." A related word in Hebrew, "balal" means "confusion." Nimrod probably began to build his cities within a hundred years of the Flood. The confusion of tongues is usually thought to have occurred during the days of Peleg (Gen. 10:25). The chronology one derives from most English Bibles, which are translated from the Masoretic Hebrew text, places the time of Peleg only about 100 years after the Flood. This is probably incorrect. Barry Setterfield dates Peleg as living 530 years after the Flood, using the Vorlage Text and the Septuagint (LXX). See his Creation and Catastrophe Chronology. The dates computed by Setterfield seem to be a much better fit to what we know from archaeology and recorded history about the ancient civilizations of Egypt and Fertile Crescent Region. The world population at the time of the Dispersion at Babel may have been of the order of tens of thousands of persons. Babylon becomes, in history, the fountainhead of false religion in the Post-Flood world. 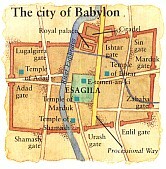 The city Babylon and Iraq figure in Biblical prophecies connected with the end of the age. "Mystery Babylon" is an even more theme in Bible prophecy. Revelation 17-18 depicts God's final judgment of world religion plus world commerce and trade since these man-made systems have sprung from the source rebellion of Nimrod and Babel. See Thy Kingdom Come, Thy Will be Done... for a description of the place of Babylon in Biblical eschatology. The appearance of the first city [after the flood, built by Nimrod] goes back in the story of Cain and Abel, when Cain went out and built a city. It illustrated the hunger of humanity to huddle together for companionship, even though they were not really ready to do it (as they still, obviously, are not ready to live together successfully in cities). God's final intention is to build a city for man. Abraham looked for "a city which has foundations, whose builder and maker is God." But man was not yet ready for that. Now here they are, again ready to build a city to satisfy the desires of body and soul. There is nothing that does this better than for human beings to live together in cities. Cities are centers of commercial and business life where all the needs of the body can best be met. Also, cities are centers of pleasure and culture, where all the hungers of the soul can be satisfied: hunger for beauty, art, and music and all the ingredients of culture. The tower, on the other hand, is designed to satisfy the spirit of man. Here we see, reflected in these two things, a fundamental understanding of the nature of man as body, soul, and spirit. All are to be satisfied in these two elementary needs, the city and the tower. A number of years ago, digging in the plains of Shinar, archaeologists discovered the remains of certain great towers that these early Babylonians had built. Some archaeologists have felt that they may even have found the foundation of this original tower of Babel. That is very hard to determine. But they did find that the Babylonians built great towers called ziggurats, which were built in a circular fashion with an ascending staircase that terminates in a shrine at the top, around which are written the signs of the zodiac. Obviously, the tower was a religious building, intending to expose man to the mystery of the heavens and the greatness of God. That, perhaps, is what is meant here by the statement that they intended to build a tower with its top in the heavens. They were impressed by its greatness architecturally, that is, it was a colossal thing for the men of that day to build and they may have thus thought of it as reaching into heaven. But they also unquestionably were thinking of it as a means of communication with God, of maintaining contact with him. God is not to be left out, you see, in the city of man. He is there, represented by this tower. However, the heart of the matter is made clear in these words, "let us make a name for ourselves, lest we be scattered abroad upon the face of the whole earth." Already a haunting fear had set in. They were conscious already of a disruptive influence in their midst, of a centrifugal force that was pushing them apart so they could not live too closely together and which would ultimately, they feared, scatter them abroad and leave them unknown, unhonored, and unsung, living in isolated communities where they would be exposed to great danger. The fear of this caused them to build a tower and a city. The ultimate motive is expressed in these words, "let us make a name for ourselves." From that day on this has been the motto of humanity, "let us make a name for ourselves." I am always amused to see how many public edifices made a plaque somewhere on which the names of all the public officials who were in power when it was built are inscribed: the mayor, the head of public works, etc. "Let us make a name for ourselves," is a fundamental urge of a fallen race. It reveals one of the basic philosophies of humanism: "Glory to man in the highest, for man is the master of things." That is the central thought of humanism, glory to mankind. The fact that this was a religious tower-and yet built to make a name for man-reveals the master motive behind religion. It is a means by which man attempts to share the glory of God. We must understand this, otherwise we will never understand the power of religion as it has pervaded the earth and permeated our culture ever since. It is a way by which man seeks to share what is rightfully God's alone. This tower was a grandiose structure, and undoubtedly it was intended to be a means by which man would glorify God. Unquestionably there was a plaque somewhere attached to it that carried the pious words, "Erected in the year ___, to the greater glory of God." But it was not really for the glory of God; it was a way of controlling God, a way of channeling God by using him for man's glory. That is what man's religion has always sought to do. It is a way of making God available to us. Man does not really want to eliminate God. It is only sporadically and then only for a relatively brief time, that men cry out for the elimination of God. Atheism is too barren, too pessimistic and too morally bankrupt to live with very long. The communists are finding this out. No, we need "dear old God," but let's keep him under control. Do not let him get out of his place. "Don't call us, God; we'll call you." This is the fundamental philosophy of society. It is the tower of Babel all over again. (from The Beginnings, by Ray C. Stedman, Waco Books, 1978. The four sons of Ham are relatively easy to trace in history. Cush is associated with the peoples of Southern Arabia and Ethiopia. Ethiopians still trace their ancestry back to Cush. Egypt (or Mizraim, in Hebrew-an ancient name for Egypt) became the father of the Egyptian Empire, settling in the Nile Valley. Put is associated with Lydia, on the west of Egypt in North Africa. Canaan centered largely in and around Palestine, though the Canaanites later became much more widespread. The account zooms in on an individual named Nimrod, who is called a great hunter. He is a rather mysterious figure of great importance in ancient history. He is the founder of both Babylon and Nineveh, the two great cities of antiquity which became, ultimately, enemies of Israel. The prominent thing that is said about him here is that he was a mighty man, a mighty hunter before the Lord. Now, it was the work of kings in those ancient days to be hunters. This was a time when civilization was sparse and wild animals were a constant threat to the people. Kings, having nothing much else to do, organized hunting parties and acted as the protectors of their people by killing wild animals. Nimrod evidently gained a great reputation as such a hunter, but he was more than a hunter of wild animals. The Jewish Talmud helps us here, for it says that he was "a hunter of the souls of men." By the founding of Babylon and Nineveh we have a hint given of the nature of this man. We are told here that he was "the first mighty man on earth," i.e., after the flood. That phrase, "mighty man," takes us back to Genesis 6 where, in that strange story of the invasion of the "sons of God" into the human race, there resulted a race of giants called Nephilim. We are told that "these were the mighty men that were of old, the men of renown." This demonic invasion of the race, with sexual overtones, brought into being a race of giants that were morally degraded. These also appear later on in the Canaanite tribes. We have found this suggestive line of thought running through the Scriptural account up to this point. Nimrod apparently was one of these "mighty men," and therefore introduced a perverted, degraded form of religion into the world. It began at Babylon, spread to Nineveh, and can be traced in history as it subsequently spread throughout the whole of the earth. Thus, in this man Nimrod, we have the seed of idolatry and false religion coming in again after the flood. If you drop the first consonant of Nimrod's name and take the others M, R, D you will have the basic root of the god of Babylon, whose name was Marduk, and whom most scholars identify with Nimrod. 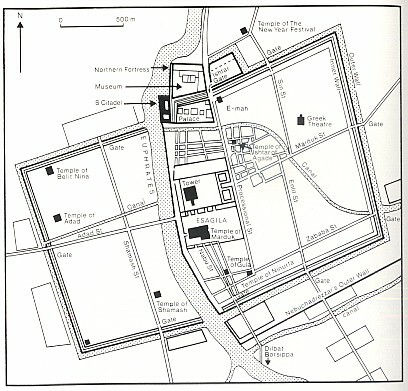 In the Babylonian religion, Nimrod (or Marduk) held a unique place. His wife was Semiramis. (In Cairo, Egypt, the Semiramis Hotel is named after this woman.) Marduk and Semiramis were the ancient god and goddess of Babylon. They had a son whom Semiramis claimed was virgin-born, and they founded the mother and child cult. This was the central character of the religion of ancient Babylon, the worship of a mother and child, supposedly virgin-born. You can see in this a clever attempt on the part of Satan to anticipate the genuine virgin birth and thus to cast disrepute upon the story when the Lord Jesus would later be born into history. This ancient Babylonian cult of the mother and child spread to other parts of the earth. You will find it in the Egyptian religion as Isis and Osiris. In Greece it is Venus and Adonis, and in the Hindu religion it is Ushas and Vishnu. The same cult prevails in various other localities. It appears in the Old Testament in Jeremiah where the Israelites are warned against offering sacrifices to "the Queen of Heaven." This Queen of Heaven is Semiramis, the wife of Nimrod, the original mother of the Mother and Child cult. The cult has also crept into Christianity and forms the basis for the Mariolatry that has prevailed in the Roman Catholic Church, where the Mother and Child are worshiped as joint redeemers. Alexander Hislop, an authoritative writer in this field, has written a book called "The Two Babylons," which should be of great interest if you desire to pursue this further. This idolatrous religion culminates at last in the Bible in the book of Revelation. There, a "great harlot" appears, whose name is "Mystery Babylon the Great," the originator of all the harlotries and false religions of earth. The essence of Babylonianism, as we understand from Scripture, is the attempt to gain earthly honor by means of religious authority. That is Babylonianism, and it has pervaded Christian churches, Hindu temples, Buddhist shrines, and Mohammedan mosques. Everywhere it is the element that marks falseness in religion-the attempt to gain earthly power and prestige by means of religious authority. That is what Nimrod began and what God will ultimately destroy, as we read in the book of Revelation. (from The Beginnings by Ray C. Stedman, Word Books 1978). Is there Archaeological Evidence for the Tower of Babel? There is an interesting feature of Moses' treatments of these descendants of Ham that is at once recognizable to one who reads this chapter. It is the parenthesis that fills verses 8-12. It comes in the middle of the table of nations and, in a sense, interrupts it. These verses deal, not with the general movements of peoples and nations, but with one particular descendant of Cush, Nimrod, who is said to have been the founder of the first world empire. Here is the first place in the Bible where the word "kingdom" occurs. Significantly, it is used, not of God's kingdom (as it is later), but of this first rival kingdom of Nimrod. This matter was obviously of great importance to Moses, for a related parenthesis occurs in the first nine verses of chapter 11, in the story of the tower of Babel. What is so significant about Nimrod? The fact that he established cities and built a kingdom is important, of course. But there is much more that can be said. Nimrod was the first person to become a "mighty" man. Our text calls attention to this by using the adjective "mighty" three times in describing him: "Nimrod ... grew to be a mighty warrior on the earth. He was a mighty hunter before the LORD; that is why it is said, 'Like Nimrod, a mighty hunter before the LORD'" (vv. 8, 9). The adjective also occurs in a similar way in 1 Chronicles 1:10. Why is this emphasized? Is it good or bad? A little thought will show that it is bad. The empire of Babylon under Nimrod was an affront both to God and man, an affront to God in that it sought to do without God (Gen. 11:1-9) and an affront to man in that it sought to rule over other people tyrannically. Martin Luther was on the right track when he suggested that this is the way the word "hunter" should be interpreted. This is not talking about Nimrod's ability to hunt wild game. He was not a hunter of animals. He was a hunter of men--a warrior. It was through his ability to fight and kill and rule ruthlessly that his kingdom of Euphrates valley city states was consolidated. Here we have a great city. But it is great, not as Jerusalem is great (as God's city), but great in its defiance of God. This is man's city, the secular city. It is of man, by man, and for man's glory. The later Babylon of Nebuchadnezzar is the clearest biblical illustration of these elements. It is about Nebuchadnezzar, who embodies the secular city, and God, who operates through Daniel and his friends. The key to the Book of Daniel is in the opening verses which say that after Nebuchadnezzar had besieged and conquered Jerusalem (though it was "the Lord [who] gave Jehoaikim. king of Judah into his hand"), he took some of the sacred vessels of the temple treasury, brought them to Babylon and there "put the vessels [in the treasury] house of his god" (Dan. 1:2). This was Nebuchadnezzar's way of saying that his gods were stronger than Jehovah. And so it seemed! God had certainly permitted Nebuchadnezzar to triumph over his own people in punishment for their sins. One evening Nebuchadnezzar had a dream that involved a great image. It was of gold, silver, brass, and iron. The head was of gold. This represented the kingdom of Nebuchadnezzar and was God's way of acknowledging that Babylon was indeed magnificent. But, as God went on to point out, Babylon would be succeeded by another kingdom represented by the silver arms and chest of the figure, that kingdom by another represented by the figure's brass middle portions, and then that by a kingdom represented by the legs of iron. It was only at the end of this period that the eternal kingdom of God in Christ would come and overthrow all others, grow and fill the earth. In this vision God was telling Nebuchadnezzar that he was not as important as he thought he was and that it was God Himself who rules history. In the next chapter Nebuchadnezzar sets up a gold statue on the plain of Dura. On the surface this seems to be only the foolish gesture of a vain monarch who insists that the statue be worshiped as a symbol of the unity of the empire. However, when the story is read with the vision of the statue of chapter 2 in view, one realizes that the later episode actually shows Nebuchadnezzar rebelling against God's decree. God had said, "Your kingdom will be succeeded by other kingdoms, kingdoms of silver, brass and iron." Nebuchadnezzar replied, "No, my kingdom will endure; it will always be glorious--I will create a statue of which not only the head will be of gold, but the shoulders, thighs and legs also. It will all be of gold, for it will represent me and my descendants forever." This personal involvement with the statue explains the king's violent reaction when the three Jewish men refused to bow down to it. It also explains the violent reaction of the secular mind to Christian claims today. It is not just a question of the Christian God versus other gods, each one presumably thinking that his or her god is the true one. It is the rebellion of man against God, period. God is He to whom we are responsible. But fallen men and women do not want to be responsible to anyone. They want to rule themselves. They want to exclude God from His own universe. at the secular city is also by man for man comes out in the remainder of Nebuchadnezzar's story. One day, a or more after the earlier incident, Nebuchadnezzar was walking on the roof of his palace in Babylon and he looked out over the city. He was impressed with its magnificence. Judging himself to be responsible for this, he took to himself the glory that should have been given to God, saying, "Is not the great Babylon I have built as the royal residence, by my mighty power for the glory of my majesty?" (Dan. 4:30). It was a claim that the earthly city been constructed by man and for man's glory. In one sense this was true. 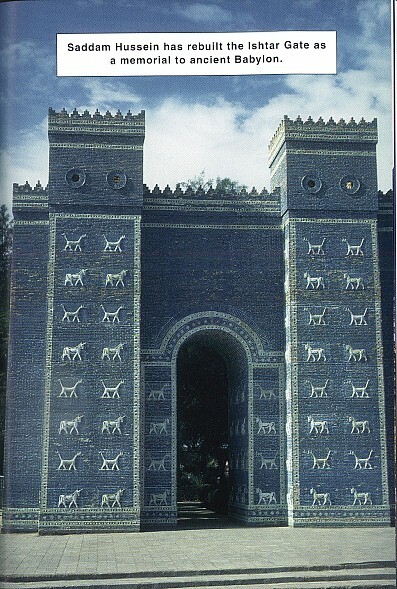 Nebuchadnezzar had constructed the city, and his conquests had brought it to great architectural splendor. Again, he had undoubtedly constructed it for his glory, Nimrod had constructed the first Babylon for his glory. What both had forgotten is that ultimately it is God who in the affairs of men and that the achievements of a secular ruler are made possible only through the common gifts of God to humanity. So God promises to bring the secular city down. Nebuchadnezzar had judged himself superior to those around him because of his political achievements, so superior that he had no need of God. God speaks to show how mistaken Nebuchadnezzar was. God says, "This is what is decreed for you, King Nebuchadnezzar: Your royal authority has been taken from you. You will be driven away from people and will live the wild animals; you will eat grass like cattle. Seven times will pass by for until you acknowledge that the Most is sovereign over the kingdoms of and gives them to anyone he pleases" (Dan. 4:31, 32). The judgment is to effect immediately. Nebuchadnezzar's mind goes from him, and he is driven from the city. The text says, "He was driven away from people and ate grass like cattle. His body was drenched with the dew of heaven until his hair grew like the feathers of an eagle and his nails like the claws of a bird" (v. 33). Eventually Babylon itself fell, never to rise again. It is interesting that in this particular branch of Ham's family we have a reversal (probably deliberate) of God's judgment on Canaan for Ham's sin in ridiculing Noah. God had pronounced a curse on Canaan through Noah, saying, "Cursed be Canaan! The lowest of slaves will he be to his brothers" (Gen. 9:25). But so far as we know, in these early days God did not put this prophecy into effect by subjecting Canaan, his descendants, his brothers, or any of their descendants to Shem or Japheth. This happened later through Israel's invasion of the Promised Land, but it did not happen in these early days. Instead, it is the brother of Canaan, Cush, and his descendants who determine to enslave the others. This is the normal reaction of the human spirit when faced with God's curse. It says, "I'll defy it. I'll take care of my own problems." So it creates the arts, raises an army, builds its cities, and marches out to make a name for itself in defiance of God's decrees. The tenth and eleventh chapters of Genesis are composed of genealogies of nations and peoples designed to link the story of Noah and the Flood, which fills chapters 6 through 9, with the story of Abraham and his descendants, which fills the remainder of the book. The genealogies begin with Noah's three sons-Shem, Ham, and Japheth-and move eventually to Terah from whom Abraham is born. At two points there are parentheses dealing with the founding of the first world empire under Nimrod. The first parenthesis is 10:8-12. The second is 11:1-9. These two go together. The first tells of Nimrod's exploits. The second does not mention Nimrod but speaks rather of an attempt to build the city of Babylon, a central feature of which was to be a great tower. On the surface these seem to be accounts of two quite separate incidents. But this is not the case. The second does indeed tell of the founding of Babylon, but we learn from the first that Babylon was the initial city of Nimrod's city-building empire. Moreover, as we study them we see that the founding of Babylon and the building of the tower of Babel in chapter 11 are an elaboration of the earlier narrative. In the first we have an emphasis on Nimrod--what he was like, what he did, what his goals were. In the second we have a treatment of the same theme but from the perspective of the people who worked with him. In each case there is a desire to build a civilization without God. The account of the building of Babylon begins by saying that the world had one common language (as would be expected due to the people's common descent from Noah) and since part of the world's people moved eastward, some settled on the plain of Shinar or Babylonia. So far, so good. God had told the descendants of Noah to "increase in number and fill the earth" (Gen. 9:1), a reiteration of the command originally given to Adam and Eve in Paradise (Gen. 1:28). The settlement of Shinar could be construed as a partial fulfillment of that command. Yet as we read we find that the goal of this particular settlement was not to fulfill God's command but to defy it. From the beginning, Babylon's goal was to resist any further scattering of the peoples over the earth and instead to create a city where the achievements of a united and integrated people would be centralized. The Bible reports this desire as an invitation to "come" together to work on this great project. It is the first important "come" of the story. "They said to each other, 'Come, let's make bricks and bake them thoroughly.' They used brick instead of stone, and tar instead of mortar. Then they said, 'Come, let us build ourselves a city, with a tower that reaches to the heavens, so that we may make a name for ourselves and not be scattered over the face of the whole earth"' (Gen. 3,4). Three things are involved in this invitation: 1) a vision for the city, 2) a desire for a name or reputation, and 3) a plan for a new religion. The plan for a city does not need to be examined at length; we have already discussed it in our study of Nimrod. The important point is that it was not God's city, as Jerusalem was. It was man's city, the secular city. As such it was constructed man for man's glory. The last of these desires--to construct a place for man's glory--is involved in the word "name": Come, let us...make a name for ourselves and not be scattered over the face of the whole earth." It was the desire for reputation but, more than that, also a desire for independence from God. This reputation was to be earned by man apart from God. It was to be his alone. We cannot forget that one characteristic of the God of the Bible is that He names people. He gives them names symbolic of what He is going to do with them or make of them. God named Adam (Gen. 5:2), Abraham (Gen. 17:5), Israel (Gen. 32:28), even Jesus (Matt. 1:21). In each case, the names point to what God has done or will yet do. The people of Babylon wanted none of this. They wanted to establish their own reputation and eliminate God entirely. Thus far in our study of Babylon the one element that has been missing is religion. But that is where the famed tower of Babel comes in, in my judgment. I say "in my judgment," but I must add that most commentators sense this truth, even though they interpret the tower in different ways. Luther says that the words "reaches to the heavens" should not be applied to the height alone but rather should be seen as denoting "that this was to be a place of worship. Candlish says, "The building of the tower 'unto heaven' had undoubtedly a religions meaning. Morris writes that in his desire to build a great empire Nimrod realized that the people needed a religious motivation strong enough to overcome their knowledge that God had commanded them to scatter abroad on the earth. He feels that the tower satisfied that need and was therefore "dedicated to heaven and its angelic host. Let me tell you what I think the tower means. First, it should be regarded as having a religious end because the Bible traces all false religions to Babylon and this is the only element in the description of early Babylon that can have this meaning. We would expect something like this from the nature of Babylon and its culture and from what is told us of all cultures that turn away from God. Romans says that when people reject the knowledge of God they inevitably turn to false gods, making them like "mortal man and birds and animals and reptiles" (Rom. 1:23). The citizens of Babylon had rejected the knowledge of the true God. Therefore, we should expect the creation of a false religion as part of their dubious cultural achievements. Again, the Bible speaks of "mystery Babylon," that is, of the reality symbolized by the earthly city, saying that it is "the mother of prostitutes and of the abominations of the earth" (Rev. 17:5). This refers, as do the ideas of prostitution and abomination throughout the Bible, to false religion. There is evidence that this was the case historically. Morris notes, "The essential identity of the various gods and goddesses of Rome, Greece, India, Egypt, and other nations with the original pantheon of the Babylonians is well established. [In fact], Nimrod himself was apparently later deified as the chief god ('Merodach' or 'Marduk') of Babylon. Second, there is the description of the tower. Most of our translations speak of a tower that should "reach" to the heavens, but it is hard to think that even these people could have been foolish enough to suppose that they could do this literally. Or even if they did, it is hard to think of them as being foolish enough to build their tower on the plain of Shinar, that is, almost at sea level, when they could equally well have built it on the top of a nearby mountain and thus have begun with a few thousand feet head start. Actually, this is probably not at all what was involved. In the Hebrew text the words "to reach" do not occur. The text speaks of the top of the tower as "in," "on," "with," or "by" the heavens (all four being possible translations of the one Hebrew preposition). This could mean that the top was dedicated to the heavens as a place of worship (the view of Morris) or even that it had a representation of the heavens (a zodiac) upon it. I think this last possibility is the real meaning, for the reason that astrology, which focuses on a study of the zodiac, originated in Babylon. Turn to any book on astrology and you will find that it was the Chaldeans (another name for the inhabitants of Babylon) who first developed the zodiac by dividing the sky into sections and giving meanings to each on the basis of the stars that are found there. A person's destiny is said to be determined by whatever section or "sign" he is born under. From Babylon, astrology passed to the empire of ancient Egypt where it mingled with the native animism and polytheism of the Nile. The pyramids were constructed with certain mathematical relationships to the stars. The Sphinx has astrological significance. It has the head of a woman, symbolizing Virgo, the virgin, and the body of a lion, symbolizing Leo. Virgo is the first sign of the zodiac, Leo the last. So the Sphinx (which incidentally means "joining" in Greek) is the meeting point of the zodiac, indicating that the Egyptian priests believed the starting point of the earth in relation to the zodiac lay in Egypt, on the banks of the Nile. By the time the Jews left Egypt for Canaan, astrology had infected the population there. Hence, some of the strictest warnings in the Bible against astrology date from this period (Lev. 19:31; Deut. 18). Still later, astrology entered the religious life of Rome. The interesting thing about these biblical denunciations of astrology is that astrology is identified with demonism or Satanism in the sense that Satan and his hosts were actually being worshiped in the guise of the signs or planets. This is the reason for the Bible's denunciation of these practices. Are we to think, then, that Satan was entirely absent from the original attempt build a civilization without God? Was sent from the formation of this first biblical religion? I don't think so. If as, then the religion of the tower actually a satanic attempt to direct worship of the human race to himself those former angels who, having rebelled against God, were now already demons. No doubt, as Morris suggests, "This project was originally presented to people in the guise of true spirit. The tower in its lofty grandeur d symbolize the might and majesty of the true God of heaven. A great temple at its apex would provide a center and an altar where men could offer their sacrifices and worship God. The signs of zodiac would be emblazoned on the ornate ceiling and walls of the temple, signifying the great story of creation and redemption, as told by the antediluvian patriarchs." But God was not in this worship. Satan was. Thus, the forms of religion became increasingly debased, the worship of the devil and his became more noticeable. "From such beginning soon emerged the complex of human 'religion'--an evolutionary pantheism, promulgated system of astrology and idolatrous polytheism, empowered by occultism and demonism. Satan is a great corrupter, so it is even possible that this system of religion was version of an earlier, true revelation heavens of God's plan of redemption has been suggested seriously and considerable evidence that the formations of stars were originally named by God (or the godly patriarchs) as a reminder of godly things, perhaps to the point of forecasting the coming of the great Deliverer who would crush the head of Satan. The time when the Lord Jesus Christ was to crush Satan's head was still far off, but in the meantime God was going to crush this first attempt at Satanism. He was not going to do it with flood or fire or some other fierce manifestation of His invincible wrath. He was going to do it in an entirely unlooked-for manner. Instead of destruction, God performed a miracle in the minds and vocal cords of the builders. He confused their language so that now, instead of speaking together and working together, their words brought confusion and an inevitable (because it was divinely appointed) scattering of these people over the earth. There are several interesting features of this part of the story. The first is a second use of the word "come." Earlier the builders had used this word for the calling of their council: "Come, let's make bricks.... Come, let us build ourselves a city" (vv. 3, 4). But now God uses the word as He assembles His heavenly council and moves to confuse their language: "Come, let us go down and confuse their language so they will not understand each other" (v. 7). It is a way of saying that God always has the last word. Like Jonah, we can say "but" to God (Jonah 1:3), although God always has the last "but" (Jonah 1:4, KJV). We can assemble our councils; but God will assemble His council, and the decree of God's council will prevail. It follows that those who choose to go their own way will always end up frustrated. The prize so earnestly sought after becomes a bubble that bursts at the first touch. The fruit of desire becomes like ashes in the mouth. We may chafe against this, but it will always be this way because we live in God's world, not our own, and because God has determined to make bitter anything that is prized above Himself. The second interesting feature of this part of the story is that God came down to see the tower the men of Babylon were building. This is an anthropomorphism, that is, God being described as if He were a man. (We are not to think that God actually had to get off the throne of the universe and come down to earth to determine what the builders were doing. All things are known to God always.) But it is not a "crude anthropomorphism," as some have chosen to call it. It is used with effect. Here were men attempting to build a great tower. The top was to reach to the heavens. It was to be so great that it and the religion and defiance of God it represented would make a reputation for these citizens of Shinar. There it stood, lofty in its unequaled grandeur. But when God wants to look at it He comes down. He has to stoop low to see this puny extravagance. It is always thus. When you stand on the ground and look up at the great pyramids of Egypt they seem immense. But when you fly over them in an airplane, even at a low altitude, they seem like pimples on the surface of the earth. The twin towers of the World Trade Center in New York City look great. But from the air they look like miniature dominoes. The Eiffel Tower is a mere protuberance. So also with our intellectual or spiritual achievements. The greatest is nothing compared to the immensity of the universe, not to mention the universe's Creator. The only truly significant accomplishments are God's (sometimes in and through us), for only these partake of the nature of God and endure forever, as God does. a third use of the word "come" in which an invitation is extended by God to man for man's benefit. God says, "Come now, let us reason together--Though your sins are like scarlet, they shall be as white as snow; though they are red as crimson, they shall be as wool" (Isa. 1:18). Jesus says, "Come to me, all you who are weary and burdened, and I will give you rest" (Matt. 11:28). "The Spirit and the bride say, 'Come!' And let him who hears say, 'Come!' Whoever is thirsty, let him come; and whoever wishes, let him take the free gift of the water of life" (Rev. 22:17). What is the result when we who hear God's invitation come to Him? It is just as He says! Our sins are washed away. Our burdens are lifted. Our spiritual thirst is quenched. Moreover, the effects of the curse are overturned and the proper desires of the human heart are provided for, not by man in rebellion against God, to be sure, but by the gracious and forgiving God Himself from whom all truly good gifts come. The curse was the confusion of languages, but God brings blessing from the curse. He gives understanding in spite of the language barrier and even promises (Pentecost is an earnest of the fulfillment) that the nations will worship together, presumably in one voice and with full understanding of each other. The Babylonians wanted a city. Their city could not stand. But God provides His people with a city with foundations that will endure forever. Nimrod's people wanted a name. But to those who stand with God and who overcome, God promises: "Him who overcomes I will make a pillar in the temple of my God. Never again will he leave it. I will write on him the name of my God and the name of the city of my God, the new Jerusalem, which is coming down out of heaven from my God; and I will also write on him my new name. He who has an ear, let him hear what the Spirit says to the churches" (Rev. 3:12,13). ­James Montgomery Boice Genesis: An Expositional Commentary. As far as the great proliferation of different languages among men is concerned, the Biblical account is the only satisfactory explanation. If all men came from one ancestral population, as most evolutionary anthropologists believe today, they originally all spoke the same language. As long as they lived together, or continued to communicate with one another, it would have been impossible for the wide differences in human languages to have evolved. Therefore, if anthropologists insist on an evolutionary explanation for the different languages, then they must likewise postulate extremely long periods of isolation and inbreeding for the different tribes, practically as long as the history of man himself. This in turn means that each of the major language groups must be identical with a major racial group. Therefore, each "race" must have had a long evolutionary history, and it is natural to assume that some races have evolved more than others. This natural association of racism with evolutionary philosophy is quite significant and has been the pseudoscientific basis of a wide range of racist political and religious philosophies that have wrought untold harm and misery over the years. On the other hand, it does seem obvious that all the different nations, tribes, and languages among men do have a common origin in the not-too-distant past. People of all nations are all freely interfertile and of essentially equal intelligence and potential educability. Even the "aborigines" of Australia are quite capable of acquiring Ph.D. degrees, and some have done so. Even though their languages are widely different from each other, all can be analyzed in terms of the science of linguistics, and all can be learned by men of other languages, thus demonstrating an original common nature and origin. There is really only one kind of man-namely mankind! In actuality there is only one race among men--the human race. The source of the different languages cannot be explained in terms of evolution, though the various dialects and similar languages within the basic groups are no doubt attributable to gradual diversification from a common source tongue. But the major groups are so fundamentally different from each other as to defy explanation in any naturalistic framework. Only the Bible provides an adequate explanation. Originally, after the great Flood, "the whole earth was of one language and one speech" (Gen. 11:1). Because of man's united rebellion against God, however, refusing to scatter throughout the world as He had commanded, and concentrating instead in the vicinity of the original Babylon, "the LORD did there confound the language of all the earth: and from thence did the LORD scatter them abroad upon the face of all the earth" (Gen. 11:9). Presumably about seventy families were involved in this dispersion, as suggested by the enumeration of seventy original national groups and tongues in the so-called Table of Nations in Genesis 10. These were represented originally by perhaps a thousand or so individuals, divided into three main ancestral family bodies, the Japhethetic, Hamitic, and Semitic. "These are the families of the sons of Noah, after their generations, in their nations: and by these were the nations divided in the earth after the flood" (Gen. 10:32). The rebellion at Babel was not some impossible undertaking, such as attempting to reach heaven with a man-made tower, as one might infer from the King James translation of Genesis 11:4. The words "may reach" are not in the original; the correct sense of the passage apparently connotes the erection of a great temple-tower dedicated to the worship of the "host of heaven," uniting all mankind in worshiping and serving the creature rather than the Creator (Rom. 1:25). The most effective way of halting this blasphemy and of enforcing God's command to fill the earth was that of confounding their languages. If people could not communicate with each other, they could hardly cooperate with each other. This primeval confusion of tongues emphasizes what modern man often fails to realize: the real divisions among men are not racial or physical or geographic, but linguistic. When men could no longer understand each other, there was finally no alternative for them but to separate from each other. If anyone is inclined to question this explanation of the origin of the major differences among languages, then let him offer a naturalistic explanation that better accounts for all the facts. No one has done so yet. Obviously a miracle was involved, but the gravity of the rebellion warranted God's special intervention. Although the major language groups are so different from each other as to make it inconceivable that they could have evolved from a common ancestral language group (except, as noted above, by such a long period of racial segregation as to cause the corresponding races to evolve to different levels themselves), the very fact that all the languages can be evaluated by common principles of linguistics, and that people can manage to learn other languages than their own, implies an original common cause for all of them. Noam Chomsky, who is one of the world's foremost linguists, is convinced that languages, though completely different on the surface, reflect an underlying commonality related to the fundamental uniqueness of man himself. No doubt the Tower of Babel is merely a figure of speech to Stent as well as to Chomsky, but the figure is appropriate precisely because the miraculous confusion of tongues at Babel does provide the only meaningful explanation for the phenomena of human languages. Thus the "phonological component" of speech (or its surface form) is the corpus of sounds associated with various meanings, through which people of a particular tribe actually communicate with each other. Each phonology is different from the phonology of another tribe so that one group cannot understand the other group. Nevertheless at the "semantic" level, the deep structure, the "universal grammar" (the inner man! ), both groups have fundamentally the same thoughts that need to be expressed in words. It was the phonologies or surface forms of languages, that were supernaturally confused at Babel, so that even though all still had the same basic logic and understanding of experience, they could no longer work together and, thus, finally they could no longer stay together, simply because they could no longer talk together. It is significant that traditions similar to the Babel story exist in various other ancient nations and even in primitive tribes. Although not as frequently encountered as traditions of the great Flood, many tribes do have a tradition of a former age when all people spoke the same language until the languages were confused as a judgment of the gods. Thus there is good reason to accept the Biblical record of the confusion of tongues at Babel as the true account of the origin of the different major language groups of the world. Evolutionists certainly have no better answer, and the only reason why modern scientists tend to reject it is because it was miraculous. To say that it would have been impossible, however, is not only to deny God's omnipotence but also to assert that scientists know much more about the nature of language than they do. No one yet adequately understands the brain and its control of human speech. Therefore, no one understands what manner of physiologic changes in the brain and central nervous system would be necessary to cause different groups of people to associate different sounds with any given concept. Perhaps future research will throw light on this phenomenon but, in the meantime, there is no better explanation than that it was God who did "there confound their language, that they may not understand one another's speech" (Gen. 11:7).--Henry M. Morris, The Biblical Basis of Modern Science 1984). Chapter One from "The Origin of Speeches: From the Language of Eden to Our Bable After Babble"
1)	Dunbar, Robin,	"Grooming, Gossip, and the Evolution of Language"
2)	Pinker, Steven,	"The Language Instinct: How the Mind Creates Language"
3)	McWhorter, John H., "The Power of Babel: A Natural History of Language"
The oldest passage in recorded human history about historical linguistics is Genesis 11:1. Naturally, it is the last place that historical linguists will look for answers to the mysteries of the existence and dispersion of human language. "At first, the whole habitable earth [from Edenic AReTZ] had its one divinely programmed computing language -- [Edenic, best demonstrated in Biblical Hebrew roots] with a unique and economical vocabulary -- [so, despite their numbers and racial diversity, all people were on the same page]". In the familiar K.J.V., Genesis 11:1 reads: "And the whole earth was of one language, and of one speech". "VaYiHee Kol HaAreTZ SaPHaH AKHaT ooDiVaRim AKHaDim". Perhaps you can hear "whole" in KoL, "earth" in AReTZ, "speech" in SaPHaH, or even (with an anagram-like metathesis) German vort and English "word" in DaVaR? If you can hear those echoes of Eden in the English words, it's all the more amazing that "scholars" or "scientists" could not or would not hear them all this time. 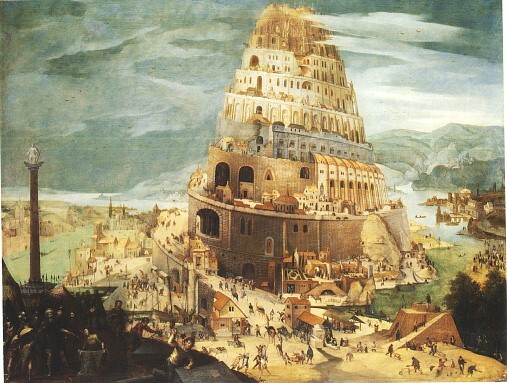 Fitting the historical movement of this chapter, most people first accepted the existence of The Tower of Babel (and its ramifications of an involved Creator), then modern linguists rejected it as a myth. Finally, contemporary linguists have come to accept an archaeological Tower of Babel, and even the concept of an original global human language -- as long as there is no deity first creating, then "confusing" or diversifying tongues. The premier evolutionists and linguists concede that human language and the uniquely human capacity for language is a mystery. M.I.T. 's William Chomsky, has recently speculated that the brain was hardwired for language by some sort of superhuman engineer. Middling academics and writers (see C in the readings above) still posit that humans developed grammars and vocabularies out of simian gestures and grunts. There are a few possible sites for the historical tower of Babel. All of them in Saddam's hometown. One doesn't have to be a U.N. inspector or a geopolitical pundit to realize that Iraq (ancient Babel or Babylon) is an appropriate site for confused language. The precise site of the ancient Tower of Babel is a matter of uncertainty for there are remnants of several ruins in the region that are possibilities. Many writers, following Jewish and Arab traditions, locate the Tower ruins at Borsippa (the "Tongue Tower"), about 11 miles southwest of the northern portion of Babylon (formerly a suburb of the city). Others identify the site with Etemen-an-ki ("the temple of the foundation of heaven and earth"), which is located in the southern sector of the city near the right bank of the Euphrates river. One or the other of these ruins may represent the archaeological "descendant" of the original Tower of Babel. Unfortunately, natives have been borrowing bricks from these sites for millennia. The Tower of Babel will have to be reconstructed brick-by-brick, word-by-word, in the study of Edenics. Cultures as diverse and far apart as the Chinese and Maya have ancient traditions about a single, global language and an instant diversification by the Creator. Scholars shrug this off as a coincidental myth. Does Genesis specifically say that Adam and Eve were created with a divine language, or that Hebrew was the language of Eden and the angels? No, but there are verbatim quotes of the Creator, the angels (even in later books like Ezekiel), and Adam and Eve that are always and only in Hebrew. Kabbalah classifies the human as "the speaker", and it is instructive to examine the passage on the creation of Adam. Other Genesis passages quote these first homo sapiens (thinkers). Later on you will encounter Adam's naming of animals (Genesis 3:19), and can assess just how perceptive and apt these Edenic names are. Check with your favorite Bible for Genesis 2:7. There, the first (modern) human has the divine spirit blown into his nostrils -- (perhaps blowing out the suddenly large brain case of this strangely divine animal. In Eden, in touch with the Lord, Man becomes Homo Sapiens. Sapient means thinking, and unlike emoting, thinking requires language. Whichever way you interpret it, Adam receives the ability to think abstractly, truly something no animal can do, and something that classifies humans as being "in the image of God". The antagonist of Eden, the Nakhash, also speaks. Some see this creature as a "Serpent", while others may prefer a more interpretive if logical "Neanderthal" -� type of soulless hominid. Either way, the Nakhash is not considered rational enough to be given any rules, or to get a hearing after he has broken those rules. Importantly, the Nakhash would only later become the limbless (all tail, all animal) snake, who abused and lost his ability to chew food (snakes merely swallow), and has abused and lost the human ability to speak (snakes merely hiss). Just as the Bible references place names before they were named, Nakhash is named Serpent before this aspiring top animal was justly demoted to the lowest of reptiles. The Nakhash of Eden is relevant here as foil to homo sapiens, Man the thinker and speaker. Whether of not you prefer to demonize Nakhash, it embodies the animal, the instinctual -� the opposite of what the Lord wants of us humans who are to use divine teachings to overcome our inner Serpent. As you progress in the study of Edenics, you will see why NeeKHooSH means sorcery or magic, and why terms of instinct, like GUESS and HUNCH come from Noon-Het-Resh. No matter how well Edenics 101 defends the Biblical thesis, it may not be true that ALL humans think in Edenic, and the output stage, or spoken language, is always a simple variation of the Edenic. There is one exception that proves the rule. The exception is the language of the African Hottentots. This isolated tribe speaks in an elaborate code of clicks and whistles -- not with the usual consonants (whose variants we shall soon study) nor the ordinary vowels (which even vary within neighborhoods of large cities). Are the non-speaking Hottentots truly human? Are they some sort of pre-Adamic spawn of the animal-Nachash who are lacking true divine souls -� (as some fear about sociopaths who have no divine conscience)? I don't think such drastic theories are necessary. Perhaps some children got lost and isolated from other speakers, and so developed a code of signals instead of the usual verbal phrases. Because the Hottentots have a human mind, their grammar and vocabulary are quite sophisticated �- especially when compared to the most elaborate animal communication systems (such as that of dolphins). Yes, there is the apocryphal story of a king who raised children without contact with speech...and those children spontaneously began to communicate in Hebrew. It's not anywhere near that simple -- even if language, originally Edenic, was hard wired in the human brain. This is why Edenics will require the mastering of several basic linguistic givens, and a scientific, not a mystical, way to see that even Chinese, with its many dropped consonants replaced by tones, is a form of the language of Eden. Language for homo sapiens is factory-installed, the language program that came with our neurological and other anatomical hardware. No mentally disturbed cat ever barked like a dog, but there is a paranormal, but not rare, phenomenon among humans where a speaker in a self-hypnotic trance can "speak in tongues". Technically called Glossolalia, this ecstatic, unclear and repetitive speech is usually considered a speech-related neurological disturbance -� not the brain accessing an unknown language. More rare and less documented or understood is the phenomenon called Xenoglossia. This involves the ability to spontaneously speak a foreign language without prior exposure. If this is ever scientifically confirmed, it would surely support the Edenics scenario, where people all have an original computing language primal language program, and are only a neurological disturbance (such as at Babel) away from being able to access even long dead languages. The original 70 super-languages were variants of Edenic much like a spectrum bends light to different colors. The analogy may be all the more appropriate if the Creator only made the rainbow after the Deluge. In any case, the dominant activity of early Genesis creation involves "separation" or diversity. The Creator made the original or "pure" forms of language or dog. In the genome schema was the ability to adapt and diversify. Thus Chinese doesn't resemble English, nor do Great Danes look like Pugs. A second Biblical passage is needed to establish the Edenic Language of Eden as the "Pure" Language of our past...and future. The second most significant Biblical verse on language, after Genesis 11, is at the other end of the Hebrew Bible, and forms a second bookend to it. The existence of a Sacred Tongue is a given, and the prophet Zephaniah must be referring to that same pre-Babel Edenic language of Genesis 11:1. "I will restore to the peoples a pure language, that they may all call upon the name of the Lord, to serve Him with one consent" [Zephaniah 3:9]. Here, in Zephaniah 3:9, the pure, primeval Edenic speech is the subject of a crucial prophecy describing the End Time. Knowledge of this global, unifying, uncorrupted language is envisioned to be a significant part of the worldwide god-consciousness of the Messianic Era. So, when will the Messianic Era be fully here? When enough of you Edenics students do teaching and www posting, and when the research is strong enough to convince everyone, of every tongue, that proof of our one Creator is at the tip of our tongues. For millennia the Biblical account of a Mother Tongue is not challenged by the greatest scholars and thinkers -� even though there would be some cultural advantage for the ancestors of Greek or Latin to gain independence from a Biblical patriarch. Some interesting illustrations of this involve Christopher Columbus. His expedition left the rabidly anti-Jewish Inquisition Spain at the same time of the Spanish Expulsion of the world's major Jewish community. No Jew was to be given a reprieve from the public pyres of the Inquisition with a ticket on the Nina, Pinta or Santa Maria, yet Columbus was permitted to bring a Hebrew speaker on board. Why? When they encountered exotic natives of new lands it was assumed that only a Hebrew speaker would be able to communicate with them. The Jewish First Mate's name was De Torres, and he was responsible for naming the exotic New World's large, fan-tailed pheasant. He named it a TooKey (exotic bird in Hebrew). Others heard it as "turkey", (perhaps assuming that the country of Turkey was somehow involved with the search for a passage to India). De Torres also named the New World cannibals KeLeBH (dog in Hebrew). This was heard as "carib", and so the region of the Carib people came to be called the Caribbean. The next chapter will involve the relatively few words from actual, historical Hebrew words. After that, we'll concentrate on Edenic words from pre-history. The paragraph above is only to illustrate the then catholic (worldwide) acceptance that Hebrew was the Mother Tongue. For all the spread of Biblical knowledge that the conquering and colonizing European Catholicism can be "credited" for, it is only with the rise of Protestantism that the root language of the Bible can be heard above the Latin. After all, Catholicism de-emphasizes Bible reading, so centuries of new Christians were barely aware of Biblical texts about language, or the literal Hebrew roots of their faith. More specifically, only when Puritan Protestantism emerges do we first find Christian scholars actively venerating Hebrew, rather than classical Greek and Latin. John Milton achieved a remarkable familiarity with the Hebrew of the Bible and of Biblical commentaries, and it informs his epics like "Paradise Lost". The Puritans of New England politicize their Hebraism, considering themselves the new Adams in a new world, and the new Hebrews in a promised land. On Burial Hill in Plymouth, Mass., the tombstones are in Hebrew, and Governor William Bradford's diary is in Hebrew. The University of Kentucky website presents the following on Bradford, which may inspire many of us to take up Hebrew. "Though I am growne aged, yet I have a longing desire to see, with my owne eyes, something of that most ancient language, and holy tongue, in which the law and Oracles of God were written; and in which God and angels spoke to the Holy Patriarcks of old time; and what names were given to things at the Creation". It was also Bradford's way of returning to the origins of Christianity, thus of purifying his faith by seeking a more direct, unmediated experience of divinity. Rather than English biblical scriptures translated from the Latin, themselves translated from the Greek and [a surface level treatment of] Hebrew texts, Bradford wanted the originals in that "holy tongue" used to name things "at the Creation". It will soon be clear when we get to animal names, parts of the body, etc. that only Edenic is the language of Creation. The first universities in America, Harvard and Yale, have Hebrew among their course requirements and their school mottos. The first doctoral dissertation in the New World, at Harvard's school of divinity, is about Hebrew as the Mother Tongue. A century later the Continental Congress debated whether Hebrew should become the new American language. Can you imagine if Hebrew would now be the world's lingua franca, as English is now?! However, regional rivals to the New England divinity-schooled delegates insisted that German or French would better serve as a break from the British. Practicality won out in the end, and English was retained. Noah Webster, America's premier lexicographer, gives many "Shemitic" (Semitic) etymologies as sources for English words in what was supposed to be the great American dictionary. For example, he cites YeLeD, boy in Hebrew -- (the LD root appears throughout Semitic) -- as the source of LAD. In contrast, the Oxford English Dictionary, says "origin unknown". Webster's work would soon be eclipsed by the British Ben Johnson, and the European's new thinking that Biblical theories were embarrassingly old fashioned in their new Man-centered Age of Reason. The Mother Tongue stuff was now an old wives' tale of ancient superstition. So Harvard trashed the true truth, Hebrew EMeT, for the Latin motto veritas (truth). Latin truth is from Hebrew words like BaReeY, surely, and BaRooR, evident -� but we shouldn't confuse academia for verity. Benign neglect of things Biblical becomes sharpened to academic hostility as Eighteenth Century rationalism is stirred first by Darwinism and then by the pre-Nazi ideas of the Nineteenth Century. Not only is industrial Man in charge of his destiny, not some mythical creator, but the human species is the fittest, and some races are the most fit to survive. If God was dead, the concept of language being a divine gift was stillborn. Linguistics becomes a racially-tinged science in the age when the skulls of non-Aryans are measured for their racial inferiority. Nineteenth and Twentieth Century Man is not about to consider the sanctity of language in the age of propaganda and advertising, and when linguists think of the origin of words, they hear no more than the grunts of gorillas. To post-Darwinian secularists, the concept of human language being created, and not evolved from ape-men, is dangerously mythic, primitive and medieval. 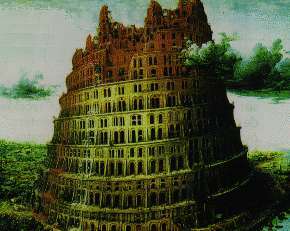 Even for many ministers, priests and rabbis, a literal acceptance of the Tower of Babel scenario (Genesis 11) and a belief in Hebrew as the Mother Tongue is overly fundamentalist. There are even many fundamentalist Christians today who feel that the Hebrew as Mother Tongue thesis overly emphasizes the Bible's Hebrew (or Jewish) roots, so they feel vaguely threatened. But Edenics is a science-based faith, not a faith-based science, so let us put any doctrinal differences aside. Are those who see the engineering of a Higher Power or Divine Being in Edenics really the fanatics? On the contrary, Edenics students will see that believers in secular theories about the origin of ratiocination (the uniquely human ability to think and speak) are the alchemists of voodoo science, the die-hard fanatics of a soon-to-be bygone era. It is the atheists who have taken a blind leap of faith into nihilism, and have missed the elaborate patterning that makes it obvious that language in its pristine state -- Edenics, as documented in Biblical Hebrew -- has been created by the same unparalleled Engineer of anatomy, chemistry and physics. Whether the field is geology or entomology (bugs, not words), scientists are usually good at WHATS, but avoid WHYS. Secular revelation's first commandment is "Evolution is the Lord thy God". The priests of godlessness can tell us that porpoises have leg-bones, and were once land creatures, but not WHY most species don't simply fail to survive as not the "fittest". WHY does the fossil record show no land mammals in the million-year process of becoming marine animals? The possibility of a Creator instantly morphing or "evolving" several species who couldn't make it to Noah's ark and allowing them to survive the Flood is not considered. The possible existence of a Higher Being who might care for the survival of all His creatures -� even humans �- is not in the equation. Secular science has eliminated the consideration of any divine care that may be behind Genesis, the adaptability of the created animal kinds, or, for us bipeds, the de-evolution of the original human programming language. This Big Bang of language diversity was to have happened at Babel -- traditionally breaking up the language of Eden into 70 superfamilies. To follow the 70, see Genesis 10 (where 70 ur-nations are listed), Genesis 46:27 (where a symbolic count of 70 sons of Jacob enter the Diaspora) and Deuteronomy 32:8 (where this symbolic number is equated to the original nations). The seventy original spin-offs have since continued to devolve or corrupt into the 5,000 dialects we have today. When the scholars of the American Heritage Dictionary put out their chart of Proto-Indo-European and its derivatives they have thirteen branches. Germanic is to come purely from the source, while the little-known, extinct branch called Tocharian lumps together Tocharian A and B. When Genesis 10 lists the subfamilies of Japheth (the Indo-Europeans) the total is fourteen (remarkably close to the Bible's thirteen). Scientists don't consider WHYS, but WHY might a Creator of a single human language fragment this precious gift and allow nations to talk past each other in Babel-babble? The Bible suggests that it was decided on high to kickstart multinational human history and not let Earth become the single-minded dominion of the Saddam Hussein of his time (Nimrod the first tyrant). Evolution is a marvelous ideal for atheists. Things get better by themselves. Sadly, there is entropy in the world. There is morning and evening, birth and death, a frame around life to force us to make life a work of art �- rather than an endless stroll in a garden of hedonism. Entropy, that which drives everything to eventually break down, is certainly true in the constant creolization or pidginization of language. De-evolution, breaking down into dialects, is what can be most easily observed. There is no evidence of languages progressing, magically coming out of Africa as apes began to lose hair and stand erect, as the "I love Lucy" anthropologists imagine. We all know how Latin broke into French, Italian, Spanish and several other dialects-turned-languages. The elaborate tracings of our many Earth languages to a Proto World or Mother Tongue involved excellent and accurate work. There is only one small error on the secular family tree of languages -� involving one minor branch of West Semitic called Hebrew. Even Biblical scholars correctly point out that the Table of Nations in Genesis 10, including phrases like "after their tongues", precedes The Tower of Babel incident (when mankind goes into Chapter 11). But Torah is organized by logic (and theo-logic), not chrono-logic, and so there is no problem if the genealogies are listed earlier under the children of Noah, humankind's three primary colors: Shem, Ham and Japheth. It's true that there are Semitic, Hamitic and Japhethetic languages. (This group was first called Indo-Aryan, but then got sanitized to Indo-European after WWII). On the surface, Hebrew, seems to be just another Semitic language that developed centuries later than Akkadian or Ugaritic. Sadly, even Hebraists had a "surface" knowledge of Hebrew as compared to what you will soon know. Post-Biblical Hebrew is a later Semitic language, like Arabic. Ancient Hebrew, however, is ten generations older than even Noah. How is that possible, when Abram, a Chaldean who spoke Chaldee, only founded the Ivri or Hebrew people and language (Ivrit) ten generations after Noah, and was old enough to have his own language confused at Babel? Abram's native Chaldee was spun off from Edenic at Babel. Ever since verse four in Genesis, the hallmark of Creation was diversity, and the key word "separation". Light and darkness, water and dryness are separated. After the Deluge, a "sign" of this divine diversity is showcased. The rainbow is one light bent into a spectrum or rainbow of what we call colors. Similarly, the one, factory-installed human computing program (Edenic) was diversified with a neurological disturbance at Babel. As we shall note in later chapters, root letters and their sequence were not just scrambled and shifted, but different peoples, the founders of different cultures, recalled and/or used different (scrambled Edenic) terms to describe similar things. How then could Abram found a clan of Hebrew speakers, rather than, at most, a dialect break-off of Chaldean? Would angels or some supernatural source teach the man who would later be Abraham the already lost language of Eden? Some of the more mystical Bible commentators assume so. Observing the time line, it is easier to presume that Shem son of Noah never lost his Edenic language. Shem and his son Ever are thought to have taught Edenic (or Ivrit) to Abram. (Many think that Ivrit or Hebrew means the language of Ever, that is, the pre-Flood, pre-Babel Edenic tongue of Noah and beyond). This is not Scripture but Medrash or lore, but tradition even notes the cave in Sefad (Northern Galilee) where this took place. Of course, the recorded longevities and the dates showing that Shem (b. 1558 of Creation � d. 2158) and Abraham (born in 1948 � d. 2123) shared 175 years of life are not usually considered when pondering a pre-Babel language or the mysterious appearance of Hebrew. Semiticists presume that Hebrew is later than Akkadian and Ugaritic, but the evidence reveals that the Edenic core of early Biblical Hebrew preceded the 70 oldest linguistic ancestors formed at Babel. Abram was a youngster of 48 at Babel, so his Edenic could well have been lost. Old Shem was a mature 438. Perhaps other old-timers might have retained Edenic too, but only Shem had the spiritual concern to perpetuate the Sacred Language with his son Ever, and his spiritual successor, the future Abraham. O.K., so a literal Bible Believer might accept that the initial Big Bang of language dispersion was a divine act at Babel. How do the secularists explain it? Well, scientists don't really do WHYS, like "WHY are there separate languages?" They would say that The Tower of Babel is an etiological myth invented to answer the problem, akin to the Prometheus fable to explain fire. Why do so many distant, ancient cultures have the myth of a global deluge and Mother Tongue? They're not sure, but they know they don't like WHYS. The now-debunked scientists who reigned during the first two centuries of linguists would say that separate human stocks (races, etc.) evolved from separate monkey species and troops. Naturally, each race had their own verbal signals evolved from the gesturing and grunting of different apes. (More in the introduction to The Word). After the racist monkey business fell out of favor, some contemporary psychologists (see Dunbar above) posit that the conspiratorial disguising of languages with dialects promotes select allegiances, an evolutionary trait we continue from our grooming, gossiping past as monkeys. But, like Ruhlen (see above), Dunbar also accepts the contemporary premise of the existence of a fairly universal, primeval Mother Tongue. WHY, then, did that first language break up into the separate language families that subsequently de-evolved into the 6,000 dialects or tongues that we have today? Again, WHY is the province of theology, not science. (Beyond interpretations of the Bible's Tower of Babel "reasons", one must consider the entire enterprise of a multi-cultural Earth, having different perceptions, but seeking one objective Truth �- finally finding it after six millennia of striving (Genesis 2:3 and Zephaniah 3:9). More on this later. Then, WHY did this naked ape evolve a unique throat bone (the hyoid bone) to enable speech far more sophisticated than dolphins, or than other species that also coordinates hunting and gathering. WHY evolve a Pavoratti or a Shakespeare? Oh yes, scientists don't like WHYS. "Just the facts, Ma'am". It is unfair to speculate about an intended, engineered word with thinking and speaking, language, literature, or even, Heaven forbid, Scripture. Back to that hyoid bone. The oldest skeletal remains EVER found, ANYWHERE, with an intact hyoid bone -- indicating a true human who spoke rather than the monkey-business of archaeological skulduggery � was found in the Carmel Caves near Haifa, Israel. In other words, the actual evidence indicates that, until proven otherwise, the oldest human speech was proto-Semitic. (An on-line verification of this oldest speaker's skeleton (called Moshe) is at http://faculty.vassar.edu/piketay/evolution/Atapuerca.html The Carmel Caves are called the Kabera Caves here). If the same remains were dug up in India, China or Africa, you can bet that the so-called Indo-European roots in many dictionaries would be traced back to ancient forms of Sanskrit, Sino-Tibetan or Nilo-Saharan. Later on you will see many obvious examples of Indo-European roots that are mildly disguised forms of Edenic. Linguistics is about the essence of cultures and races, so it is naturally susceptible to racism. Beyond an aversion for WHYS, there is a clear antipathy for anything that points to a Creationist thesis, especially (shudder) if it should involve the Bible. As reviewed in this chapter, the most intelligent, educated minds in previous centuries who accepted Genesis 11 as fact, went on, after Darwinism, to rejecting and replacing the Bible's take on language. Only in recent years has weird, twisted Nineteenth Century science been eclipsed by more thoughtful and objective work that can accept the existence of a Mother Tongue. Not yet completely objective however, contemporary linguists still assume that language evolved and devolved with no superhuman engineering. Much excellent work has been done in linguistics, even historical linguistics. But secular scientists still want to record observable, regular facts, rather than answer large questions. For instance, WHY are many words universal? Langacker (see above) provides the old, largely dismissed ways that words evolved. Words reflect sounds? Only for a few like "ding" or "chickadee". The Bow-wow theory predicts that languages would have names for dogs that sound like a bark. None do, so the Bow Wow theory is for the dogs. Langacker notes how dozens of unrelated languages have papa-type words for father and mama-sounding words for mother. His generation believed that M and P sounds were the earliest made by babies, and so they evolved into terms for parents. Academics don't have many babies, or they'd know that gaga is the first baby sound. And there are no mother or father words like gaga. No one tracing the roots of language would search the first language ever called the Mother Tongue in recorded history, but Aleph-Mem, EM, the Hebrew mother, reverses to mean From, MeY, as in a matrix or mother. The Hebrew father, Aleph-Bhet, reverses (via the common phenomenon of metathesis) to mean Come, as in come from, the English preposition OF (from), or in the Russian suffix �ov (GorbachOV), a locative meaning "comes from". See the "MAMA" and "PAPA" entries in The Word. Only Hebrew offers meaning, or sense to sounds. But linguists don't ask WHY a sound means something �- unless it's like "ding" and rings a bell. WHY are only homo-sapiens sapient (thinking)? How does the human species get more fit or survivable by getting the ability to conceive of an Eternal Creator beyond time and space? With all of their meticulous work tracing language families, studying grammar, etc., linguists remain bugs in a rug. They never get the elevation to see that the chaotic fibers they are studying add up to the immense patterns of a beautiful and elaborate oriental rug. We will no longer stray from the topic of language. God is in the details, and we will study the divine details. But here at the start, where the clash of ideologies is relevant, let the reader be aware that we have more at stake than losing the forest for the trees, where the tree surgeons are battling forest rangers, or where Bible-haters with microscopes are pitted against Bible-Believers with telescopes. Those secular rug-bugs are skilled inspectors, but they lack vision. If you are reading this, you probably have vision. But Edenics wants you to wield the microscope too, so you can micro-manage the word of God, and see worlds and galaxies within Edenic sub-roots. A sub-root is 2 consonants in the core of the Edenic word. Usually, it is either the first or last two significant letters. In these cases, the third letter acts as a steering wheel or rudder to steer the sub towards a fleet of words of similar sound and sense. Sometimes this first or third letter can be like a prefix or suffix. The other divisional scheme is when the first two and the last two letters both are significant, and the three-letter root is really the combination, or subset of two distinct sub-roots. This may be far more common than is now known, but two good examples of this are seen at KeLeBH (see "LOBO") and PeRaKH (see "FRUCTIFY")]. Roots are examined in subsequent chapters. The children of first-generation religion rejecters can be viciously antagonistic to Biblical ideas. Witness the rabid hatred of Israel and of early Edenics by America's most prominent linguist, M.I.T. Professor Noam Chomsky, whose father was a successful, and typically secular, Hebraist. Noam Chomsky authored several anti-Zionist books over his career, recently defended the 9-11 atrocity, and, in the 1990s, launched attacks against The Word and an Edenics newspaper column. In godless Russia, scientists had no such prejudices. Cover stories of several magazines broke the electrifying news that a team of Soviet linguists working since the 1960s had concluded that much of the world's languages were linked by a common past. These include: The Sciences May/June 1990, U.S. News & World Report (November 5, 1990), and The Atlantic Monthly of April, 1991. (Feel free to look them up). It took decades of academic battles before the old guard relinquished their Darwinian myths. They still insisted that languages must have naturally evolved, but they had to admit to the evidence for Monogenesis of Language �- that there once was a single human language spoken by nearly all humanity. They could keep the frightening specter of The Tower of Babel at bay by insisting that Hebrew was just a branch of West Semitic. True, it had not corrupted much, but that is because it was an unspoken language for 17,000 years. The secular professors of Semitic all agreed that Hebrew couldn't be older than the dead Semitic languages of Akkadian or Ugaritic, and saw nothing divine or even different about the amazingly unique Hebrew vocabulary that we will study here. This new ancestral superlanguage was called Nostratic �- and, yes, it even linked Indo-European languages like English with Semitic tongues like Hebrew. This flew in the face of the old racist linguistics, that assumes that Hamites and Semites developed language from different monkeys that became the Aryan or Indo-European people. Moreover, they traced the geographical homeland of this prehistoric, single-language ancestral family very close to the Mt. Ararat landing site of Noah's ark. If only some fundamentalist Christian or Jew were behind this research, Western academia could tear them apart. But what could be said about atheist Soviets led by a Vitaly V. Shevoroshkin? These dramatic controversies were stronger since the old racist linguistics was already under fire from the pseudo-scientist's greatest foes �- the hard scientists. Geneticists like L.L. Cavilli-Sforza had done much to bring old linguistic theory on line with new archaeological data. Parallel studies in genetics research with the diverse mitochondrial DNA of many human populations concluded that the entire wide family of Man came from the genes of a single female ancestor. "Mitochondrial Eve" she was named in a cover story of Newsweek on January 11, 1988. A good follow-up article for this is Discover of August, 1990. The eminently readable Stephen Jay Gould has a fine piece in Natural History, February, 1989. The article's sub-title is "The threads of our linguistic history closely match the pattern of our biological development". Gould writes about the "acrimonious rebuttal and dismissal [of] most scholars [who] balk at the very thought of direct evidence for connections among these basic "linguistic phyla". So, try to understand that the strident enemies of Biblical thinking have not come to the Monogenesis of Language thesis willingly, and are not likely to embrace further evidence of the veracity of Genesis 11. When all the archaeological dust has cleared, remember the fact (stated above), that the oldest SPEAKING humans (with the hyoid bone) were found in Israel -� and that until older remains are found elsewhere it must be presumed that the earliest speakers were, at least, proto-Semitic. More recently, today's leading linguists, Steven Pinker and Noam Chomsky, have done much to prove than the human brain is made for language acquisition. This did not result in their understanding that language, the brain, and the mouth and throat were ingeniously and purposefully created to make Man (and only Man) a thinker and speaker. Neuro-linguistic findings logically point to the work of a Creator. Chomsky has even theorized about an alien superintelligence behind the human brain and its innate capacity for language. Well, the Lord IS extraterrestrial, so that's probably the closest Chomsky's generation will come to finding God in the details of linguistics and The Mother Tongue. Our count of 5,000 Earth languages took a major hit from the work of Stanford Professor, Joseph H. Greenberg (who passed away in 2001). First he proved that there were only 8 true African languages, not hundreds, with scores of dialects deriving from the original eight "superlanguages". Similarly, linguists counted hundreds of American Indian languages. Greenberg proved there were only three Amerind superlanguages. The Biblical concept of 70 original spin-offs from Edenic was looking better. Needless to say, Greenberg's work was bitterly opposed for decades, and only now is considered solid. Going full cycle, most contemporary linguists can accept Monogenesis of Language, thus even envisioning a historical Proto-Earth language behind the "mythical" Tower of Babel in prehistory. Robin Dunbar (his book recommended above) does not even have to add a dozen zeros to the theoretical time line. He writes that, "Babel may not have been so very long ago....The Tower of Babel was no myth: it really did exist...the myth-makers of ancient Israel seem to have been on to something. Linguists now believe that the world's languages do in fact have a common origin. However, the period of this common language long predates the building of the Tower of Babel". It is remarkable that some authorities have such a sure grasp on prehistory, when astrophysicists, for example adjust their dating by several zeros a few times a year. It's not easy to convince a secular Bible scholar or Semiticist that the Bible doesn't merely follow human chronology, or, in a specific but famous example of such folly, that the Gilgamesh Epic of the Flood was obviously a later, inferior version of the Biblical record �- not the reverse. More time and data will be needed until these deep anti-Biblical prejudices can be reduced by facts. But let clear-minded people rejoice that the theory of Monogenesis of Language, a major part of the Genesis 11 scenario, has finally come into acceptance. There is much to go, however, from the acceptance of a Mother Tongue thesis, to proving that an actual language is that Mother Tongue. It may sound difficult for a Martian, but many Earthlings resist the idea that the language describing the Tower of Babel (Biblical Hebrew) is the closest thing to that Mother Tongue of Eden �- which we shall call Edenic. Besides the interaction of Edenic and other languages, the other major part of Edenics exposition involves the unique (even divine) architectonics of Edenic/Biblical Hebrew itself. This includes built-in sound-alike synonyms and antonyms, which a humanly evolved vocabulary would never have. Edenics 101 will both reveal Edenic itself, structurally, as a science, as well as present etymological, historical evidence that Edenic is THE central hub for the variations of Earth languages. With individual words, word families, or specific categories (like animal names) this book shall attempt a first demonstration of the existence of Mankind's Mother Tongue. When we get to examine the laboratory reconstructions of Proto-Indo-European roots, or other attempts to reconstruct a Mother Tongue like Nostratic or Proto-World, we'll see how much clearer and more versatile (bendable to daughter languages) are the words that are not reconstructions but actually exist in the Bible. As the lexicographers readily admit, there never was a recorded Indo-European word. Proto Indo-European (PIE) is theoretical. The dictionary consultant is asked to rely on imaginative reconstructions rather than provable fact. It's the Great White Hope of academia. The linguists take actual words from Sanskrit, Greek, Latin, Old Germanic or Icelandic, etc. Then, in the lab, the linguists fabricate a never spoken proto root that theoretically could have devolved and broken up into the recorded, actual words of vaguely similar sound and sense. Reading the dictionary of Indo-European Roots (The American Heritage Dictionary, ed. by Calvert Watkins, Houghton Mifflin, Boston, 1985) can be painful or puzzling. The most incongruous words are grouped together with far less discernible sound or sense than the weakest of Edenic-English links. Reading the dictionary of IE roots, or noting these theoretical "roots" in The Word, can also be humorous. Especially if one knows the Biblical Hebrew word which would have neatly tied together the forced "cognates" of a bizarre entry. The Biblical Hebrew or ancient Semitic root word (etymon) is most often only a slight deviation from their fictional "root". Because this chapter involved both the theory and history of the Edenic thesis, it was largely discursive. Subsequent chapters will involve actual data, and will require more analysis of actual words on the reader's part. There is an interesting article in the Science Times section of The New York Times of March 16, 2004 by Nicholas Wade called "A Biological Dig for the Roots of Language". Here in the Biblical year 5764 since the creation of Man, it is reported that the alleged Proto-European-Root language is around 6,000 years old. Wade's article concerns a new approach for mapping the family tree of human languages besides comparative vocabularies. The new method is archeology-based and called "linguistic paleontology". 1. The introduction to "The Word" -- written in 1988 -- describes the prevailing linguistics attitude towards the Biblical thesis and the Monogenesis of Language concept with what kind of imagery? How might this have been appropriate? 2. In the Gospels, the book of John opens, "In the beginning was the word". Language, thinking and speaking, appears to be central to the plan of Creation. What are the two crucial Hebrew Bible passages describing the past and future of Edenic language? 3. What important clues indicate that language and neurology appear to be engineered for each other? What especially makes this evident in the Biblical concepts of Edenics and the Babel phenomenon? 4. Why did Darwinian, evolutionary thinking, present opposition to the Monogenesis of Language thesis? 5. How and why did linguists come to accept Monogenesis of Language? 3)	Or that such humans beyond the Near East had civilizations of equal antiquity. Explain, using knowledge of the hyoid bone. 8. How were atheist Soviet researchers the allies of a Biblical thesis of language? 9. The words for Mother and Father are identical in nearly every language. What is wrong with the linguists' old reason for this, and how is a Hebrew origin more logical? 10. If language diversity was divine, if Babel was the Lord's design to make us work towards unity from different perspectives, why is the recent reduction of the number of actual languages (reclassifying 1000s of languages as merely dialects of superlanguages) any support of the Biblical language thesis? c)	many Edenics docs - $18. Website on Edenic (Biblical Hebrew) as the 1st language: http://www.homestead.com/edenics. The Word dictionary has 320 pages; 22,000-words in index -- I'm out of stock. Revised: April 16, 2000. March 23, 2010.